Holi as per Telugu Calendar is celebrated on Phalguna Purnima or full Moon day of the Phalguna month. Holi of this year is celebrated on Saturday, 27th March, 2032. 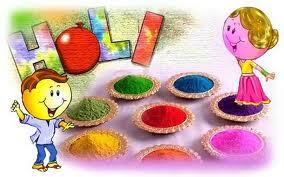 Holi which is famous as the festival of colors is celebrated with lot of joy in India. It is a national festival and everyone from kid to old would celebrate with the same enthusiasm. Holika Dhan or Kama Dahan is performed where effigy of Demon Holika is burnt on the previous night of Holi. The effigy is prepared out of all the old furniture and other useless things. On Holi, a practice of taking Bhang is there in some places. The Lathmar Holi of Mathura is very famous which attracts a lot of people. Now a days use of natural colors on Holi is being advised.